This Shadow Box represents my identity and where I come from and what I am proud to be known as. When you look at my box you may see a wooden piece that looks like a ladder but it isn’t I promise. It’s actually there to represent the San Francisco bridge and although my heart and soul is Oakland because I was born and raised in its streets I have great memories in SF. Other than having my heart and soul in Oakland and San Francisco I have recently been able to go to Mexico and meet my loved ones. The green, white, and red flags in the back of my box represent that adventure I experienced in my motherland. Not only that but I got to know many things about my ethnicity when I went to Mexico like when you look at the bridge you see coins and those are pesos from Mexico which made me look at money a different way and how much value it has,and how much value I will treat it with. Also that potato in the background isn’t much of a potato it is a “bule” it represents the hard work of my family back in Mexico they fill it with water and go to work and raise their families up to become better. One of my chosen identities for me is running I have a passion to run not only I love it but it’s a stress reliever for me. The medal represents that passion because I ran a 5k and I was really proud of myself for that because one of my assigned identities is being female and there is a lot of oppression in our society for women but to finish that race made me feel proud and powerful to be female. The numbers on the bottom left is my number I ran during my 5k; my lucky numbers I would say. Although I may not show off many of these identities as I should I am proud to be who I am with my race, ethnicity, chosen identity, and my assigned identity. Fighting Stereotypes with Counter Narratives-Leslie Gaytan by Leslie is licensed under a Creative Commons Attribution-ShareAlike 4.0 International License. The United States of America: a Nation of OpportunitiesDaniel Gonzalez: Planet Hype Shadow Box! Dear Leslie, I’m very intrigued by your shadow box. One sentence that stood out to me was when you talked about how running helped relieve stress and how it’s a passion for you. It stood out to me because I agree and I actually feel the same way about it. Your box is very creative, especially with the ladders. The medal is really pretty too. You did a good job representing and showing your identities to everyone and I want to thank & congratulate you for doing so. I really like how you described why you did your shadowbox and how you made it specific what the wooden “ladder” was and how it was actually the golden gate bridge . I also like how you talked about where you are from and how you went to your motherland . 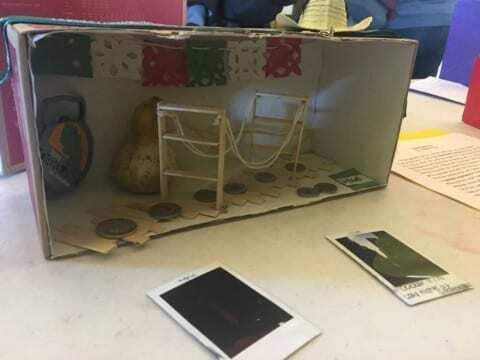 I think you should explain more about your time in Mexico , but i like how you showed things that represent other things like the blue potato respresten all your families work . I really liked your post of how you shared your experience when you were a little girl. But at the same time describing the objects you had in your shadow box because when I saw the image I thought of a different significance. This connects to me somehow because i wasn’t born in America i’m a Guatemalan girl and I feel proud of that because it makes me feel more powerful in this society were females get treated different. Also I agree with you for the last part of your story of how womans get suppressed in this society. But as how you say, you winning that metal describes another meaning of you as a female. How did you feel about money when you hadn’t visit your motherland, Mexico? Is there a person who has helped you in your struggles when you most needed them? You seeing the problem that woman’s face in this society. How would you like to make a difference in the future, if you could do something? Hope you write more about your stories because they are unique and I really enjoyed reading your post. Thank you for commenting on my post! I enjoyed reading your reply. Wow I love that you hvae so many questions! Hmm… How I felt about money well honestly I didn’t care much about it, but I also did not spend so much money or save it up ethier. But once I saw the real struggle I value it more. I didn’t really have a support system at that time but I would like to say I do right now. To make a difference as a women I would make groups of women and try to fight for our rights and I think I would also make a movement as how we have one right not but way more divers of course. There has been many cases where not alot of women of color have say as much as white women would so I would want to change that.